Club Penguin Cheats by Mimo777 Club Penguin Cheats by Mimo777: Club Penguin Recycle Mail Glitch! Dude! Have you tried to recycle your mail lately? This has been an ongoing glitch since the Fair, and Club Penguin STILL has not fixed it. 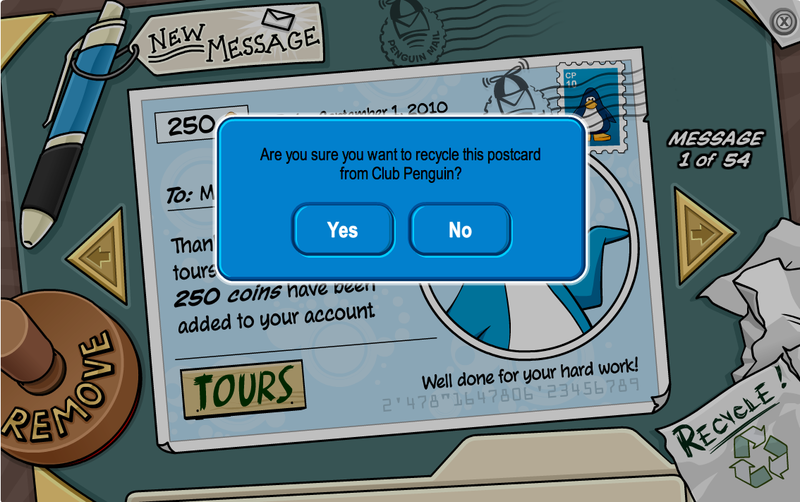 If you open your Club Penguin Mail, and want to delete a postcard, you click "Recycle," right? 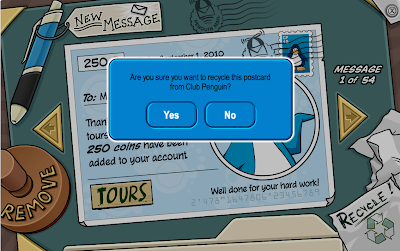 Well, when you click "Recycle," It will ask you "Are you sure you want to recycle this postcard from...?" If you click "Yes," the postcard is still there! So, the only way to delete postcards now, is to click the "Remove." But remember, you will remove ALL postcards from that person. Even if they are from Club Penguin. Try this Very cool game! BLOXORZ! You are so totally right Mimo! I have had this glitch for maybe a week or two. I just can't recycle my tour guide payday or the letter that says my membership will expire soon! Let's Hope Club Penguin fixes it or I will have a full mailbox soon! I noticed that. Weird isn't it? You would think Club Penguin would have fixed a glitch like that by now. I guess theres so much going on with everything like the release of the new game, new stamps there working on and testing, and who knows what else. yes i hate that glitch it is so annoying!!!!!!!! I noticed but theres another glich I have. On some servers my mail box said I have thirteen new postcards when I don't have any! Im not sure if anyone go this glich but I cant send epf recruitment to anybody! your right. maybe they should slow down on everything. yeah, it's annoying. i don't want my mail to be full! i already sent club penguin a "contact us" mail on the section of "bugs" yesterday and notified them. i'll let know all of you when i get a reply. I also let club penguin team know about that. it's even MORE annoying! LOL! I thought it was just me! I've had it for a month now! before the fair finished. That reminded me, when are the mod updates? annoying yes. but its not worth screaming about. Yeah been happening for a while really annoying. Oh yeah, Club Penguin Game Day! is in stores now, even in Australia. I went to JBHIFI and was there. I think Club Penguin is releasing everything at the same time for all countrys. Yeah I have same problem as Pengiimen, it says I have 5 new messages but I dont. No URLs doodles. they are against the comment rules. I found that out a couple days ago. I was confused cause i thought it was just maybe my computer but i guess not. hehe. The same thing with me! And my mail is getting full. Its so fusturating right? I don't like this glitch. And I always have to click "Remove" instead of "Recycle", which removes cool cards from friends (cause it removes all the cards from the same penguin!). P.S. Where is Igloo Uprgrades for this month?! Thanks a lot for the notice Mimo, i have been trying to erase that mails for weeks! P.S. MIMO you are the best eva! there is another glitch! you know when it says, for example, 5 on the postcard icon? well, when you look at your 5 postcards, the 5 is still there! Anoymous said...You are so totally right Mimo! I have had this glitch for maybe a week or two. 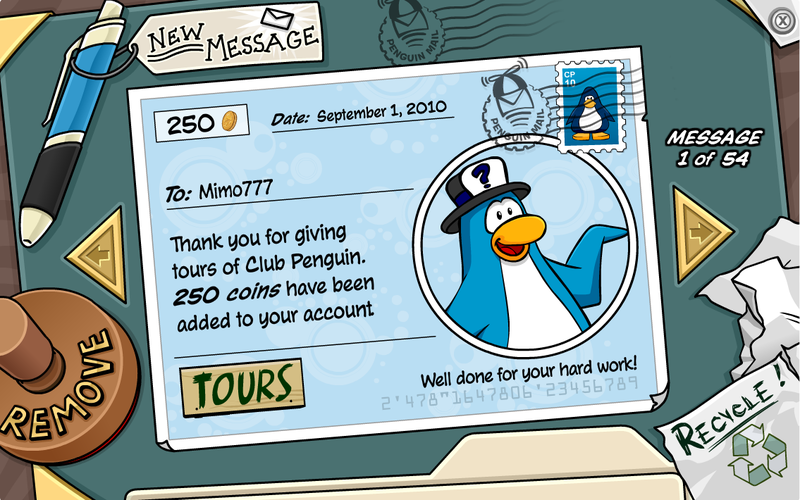 I just can't recycle my tour guide payday or the letter that stays my membership will expire soon!Lets Hope Club penguin fixes it or I will have a full mailbox soon! Well so do I,I don't hhave a card about expired membership but there is another glitch,people can send 50 postcards but i have 92 postcards!Isn't that really wierd! 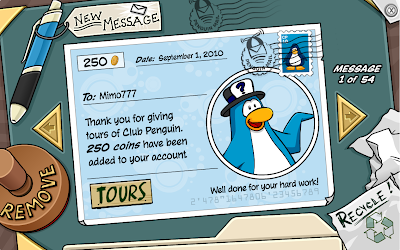 ------------------------------------The migrator glitch is the one where I went up to the crows nest and got banned for three days by mistake... Then club penguin unbanned me and gave me the rockhopper stamp and background and 3000 coins. I can't belive there are so many glitches on club penguin these days... I think they are just being lazy. Don't you? Im gonna stop commenting now. I'm probablay getting on your nerves Mimo. I Know! When I tried to remove it, it was still there too! Oce when I logged on it said I had 13 unread postcards but I didnt! DUDE! I THOUGHT MY COMPUTER WAS BREAKING!!!!!!! Ok. I heard how everybody that commented hate glitches. Here is my cp moto when i see a glitch. "Glitches are like slinkys, Everybody hates them but they are so fun to watch plop down the stairs." So say that when you see a glitch and be happy! i say dont have more than one postcard from another penguin! !